Scooters are a great choice for short-distance transportation like running some quick errands. They can also save you some great amount of money on gas. And scooters, in general, are relatively cheap. Plus, driving these scooters are a fun and unique experience. In this guide, we’ll show you the 7 best 50cc scooters in 2019. Read on to see what they are. 1. What speed does a 50cc scooter go? 2. 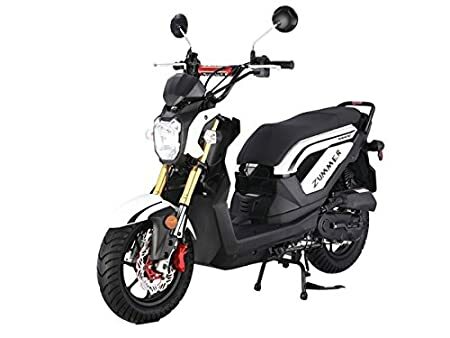 What’s the best 50cc scooter to buy? 3. How much does a 50cc scooter cost? 4. Do you need a license to drive a 50cc scooter? 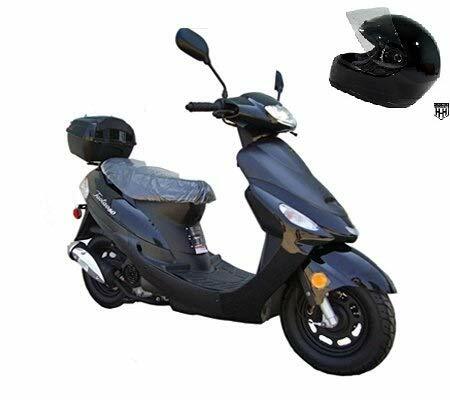 This is a 50cc gas scooter with a fully auto transmission in a sporty black color. It has been CARB approved for California and is street legal in many states. You’ll also get a HARD HEAD safety helmet included with your scooter. Pretty handy, yeah? No need to pay an extra cost for protective gear. You know, this model has been the best seller for more than 10 years. It has plenty of storage room plus enough seating space for 2 adults. TaoTao has made the registration and all the paperwork super easy for you. What I also love about this model is that it’s a great gas saver. If you’re not very good at assembling parts, there’s a great YouTube video instructions series live on the web just to help you out. So, rest assured. You’re in safe hands. The price tag is pretty decent for a scooter of this quality. So all in all, it’s a good deal. This scooter is another great choice by TaoTao. It’s cheaper than the ATM50-A1 50cc and still offers some great features. The price is unbeatable: a little over $600. It can run up to 35 MPH. That’s pretty awesome. If you need a scooter that will save you some huge amount of gas money, this is the one. For one gallon of gas, you can travel up to 110 miles. The average daily commuting distance in the U.S. is around 10 miles, give or take. So, that’s 10 trips you can get for a single gallon. I think it’s pretty economical. What’s even greater is that the seat can comfortably accommodate 2 adults. So, if you and your spouse are in it for a fun ride, go ahead. You can take a small kid with you. But be sure to protect them with helmets. Overall, it’s super easy to ride this scooter. You can also have some fun putting it together. It’s a bargain for the quality and value. If you love a little more sporty look to your scooter, you’ll love this option. It comes in 2 colors: black and red. What’s great is that they have assembled 90% of this scooter. So, it’s much lighter work for you. The scooter is street legal in all states! So, you can be worry-free about all those legal stuff. The top speed you can get to with this scooter is 35 MPH. That’s pretty decent for daily commuting. After buying this scooter, you can enjoy a 30-day warranty for all defective parts. Although it’s 90% assembled, some folks may still find that remaining 10% somewhat difficult. Which is why TaoTao has included video instructions plus basic care info right in the package. So, absolutely no worries and they’ve got you covered. Oh, and the price? It’s pretty reasonable for all of the features the scooter can give you. Do you love speed (yes, speed not speeding)? 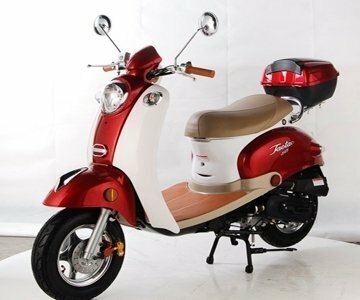 This TaoTao scooter is an elegant-looking and very modern one. You can choose from 2 colors: red or blue. The best thing of all: The engine can propel up to 45 MPH, which is great for folks who love speed. You can save a huge amount of gas money with this scooter. In fact, you can travel 110 miles for 1 gallon of gas. That’s about 5 round trips from home to work or to the nearest grocery store. This sounds like a good reason to ask your kids to run some errands, doesn’t it? The design of this scooter is so beautiful. It’s like those Italian vintage Vespa but at a much more affordable price. It can take up to 225 lbs. That’s 2 adults or 1 heavier folk. The storage trunk is huge. You can put a helmet in there and some belongings like a wallet. Driving this scooter is super fun. You’ll drive in style! Are you into some more sporty design? This Thunder 50 is another sporty-looking scooter. without a hefty price tag. It’s street legal and comes in 4 different colors: black, red, blue, and orange. You’ll look great and in-style driving this scooter. It’s a good choice because it can save you a lot of money on gas. For 1.2 gallon (that’s around $2.6), you can go up to 100 miles. For 5 gallons ($10 bucks), you can drive it for days to work or nearby restaurants or coffee shops. You’ll surely turn some heads. If you’ve never driven a scooter before, don’t worry. This scooter has fully automatic transmission. So, what does that mean? Do you know those manual and auto car transmissions? This is exactly the same thing. The scooter will automatically adjust the speed and other operations so you don’t have to manually do anything and just enjoy the ride. Sounds pretty cool yeah? All in all, it’s a pretty good deal for a scooter at this price point. Don’t hesitate. You won’t go wrong with this one. You’ll like the look of this TaoTao scooter if you’re into a clean and modern design. You can choose from 3 colors: silver, red, and blue. The scooter ships in a box with 90% of the part assembled. And the remaining 10%? It’s a breeze to put together. If you’re a bit clumsy at assembling parts, don’t worry! The instruction manuals and DVD will guide you through each step of the assembly. You’ll feel like you rock and pretty accomplished after getting this thing done. You and your loved one can enjoy the ride together because the scooter has enough seating space for two people. The fully auto transmission makes it super easy to control the scooter, even for complete beginners. You’re also backed by a 30-day warranty for any defective parts. So, in sum, this is quite a risk-free choice. You’ll look pretty cool and unique driving this scooter. Do you know those motorsports and the dirt track motor racing? While this Zummer scooter may not run at the same speed, it looks pretty close. Yes, it’s a unique-looking scooter that’s fully imported. You’ll also get plenty of legroom. Which is great news for taller drivers? This model is also great for 2 adults. How much gas does this scooter consume? Good question. It’s pretty efficient: 115 miles per gallon. That’s around $10 of gas for a week of use. It’s huge save compared to your big and bulky car. The top speed you can get to with the scooter is 25 MPH. Compared with other models, it falls a bit on the slower side. But, the brake system is very unique. It has a hydraulic front disc brake. Basically, that’s using the pressure and force of brake fluid for a quick and smooth stop in every situation. Also, it’s super easy to assemble Zummer. You don’t even have to worry about driving it because it’s very easy to control. It may take a complete beginner an hour or less to learn and drive it. If you know how to ride a bicycle, you’ll be fine. So, this scooter can make your life a whole lot easier and save you some serious money. Plus, it’s super fun and unique experience driving these scooters! 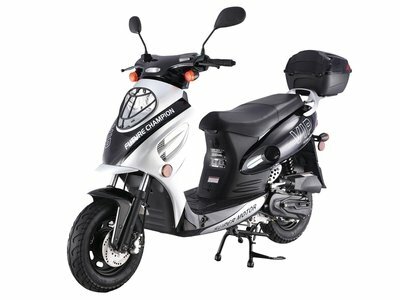 Scooters by Japanese or European manufacturers like Honda or Yamaha may cost you somewhere over $1,000 or oftentimes over $2,000. This would be a suitable choice if you’re willing to invest some more for your scooter. However, if your budget is rather tight, scooters by Chinese manufacturers can be a great deal. They have scooters ranging from $400 to under $1,000, which is 4 to 5 times cheaper. Many folks find this a bargain for the quality and build of the scooters. You may also need to spend some more on protective clothing for the scooter and for yourself when driving it. This is another very important part to get your scooter up and running: You need to register the scooter with the Driver’s License Dept. Now, this process may differ from state to state. Luckily, some manufacturers have made this process super simple and straightforward for users. You’ll get all the necessary paperwork and documents for the registration within a few business days right in your mail after you send them your scooter’s VIN (Vehicle Identification Number). Some companies will even give you a call to walk you through the registration process. So, be sure to check with their customer service or ask them beforehand so you don’t run into any headaches. Now, this may sound like bad news for folks who are not that handy: You will often need to assemble the scooter yourself. You know all that IKEA assembly frustration. We can totally relate to that. But, on the bright side, many folks love this assembly process. 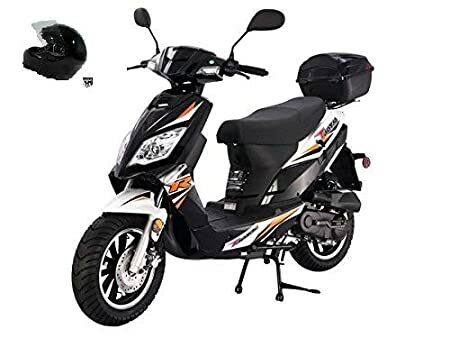 In fact, manufacturers often include the instruction manuals and other accessories in the storage box under the scooter’s seat. What’s even greater is: Some even have step-by-step YouTube tutorials with an expert walking you through each step in this process. The videos are usually around 5 minutes. Folks who are busy and don’t have the energy to read all those manuals love and appreciate these instructions videos. This can be a little project where you can get your kids excited and involved. The best thing when you’re done assembling the scooter? You can proudly say: We did it! This is our scooter! Gas mileage: Some scooters have great gas mileage from 80 to 110 MPG. Rough calculation: That’s around $10 of gas for daily commuting in a week or so. This is pretty cheap compared to car gas mileage. Weight capacity: Most 50cc scooters can support 2 adults with a weight capacity of up to 225 lbs. Electric start and auto transmissions: You’ll often get the auto transmission and electric start + back up kick start when buying 50cc scooters. This is great as you don’t have to go through the hassle of manually adjusting the speed and starting the engine. Protective gear: Oftentimes, you’ll get a safety helmet with each scooter purchase. You also should check their brake system. Some most common brake systems they use are hydraulic brakes or rear drum brakes. This is to ensure you have the most responsive and safest brakes in every situation. Depending on the model, the speed limit ranges from 30 – 55 mph. Most scooters will go about 35 mph on average. There’s no one direct answer to this question because it depends on so many factors: your style, your budget, your needs. You can have a look at our top 7 best 50cc scooters above to get a clearer idea. A 50cc scooter will usually cost you over $500. Some more advanced models can cost somewhere over $1,000. Most states don’t require a license to drive a 50cc scooter, although the laws and regulations vary from state to state. Some states do impose a minimum age limit and a permit requirement for adolescents. Check out https://drivinglaws.aaa.com/tag/mopeds-other/ to find out the latest laws and regulations in your state.